Ferrara is one of the most beautiful cities in northern Italy. Its medieval city centre has been declared a World Heritage of Humanity. 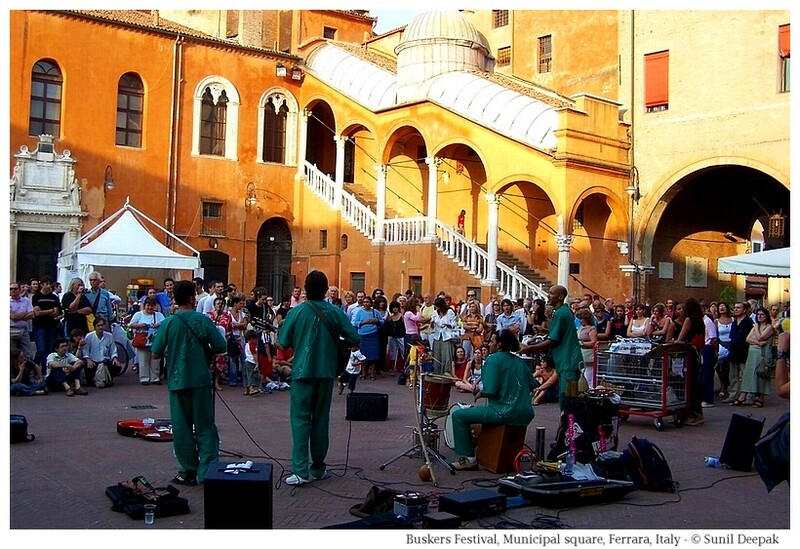 In August every year, the city centre is filled by the colourful street artists (buskers) coming from different countries for the Annual Buskers Festival. However, Ferrara is not just about the street artists. It also has many beautiful buildings and monuments. This post explains about some of the key places to see in the city, especially during the Buskers Festival. 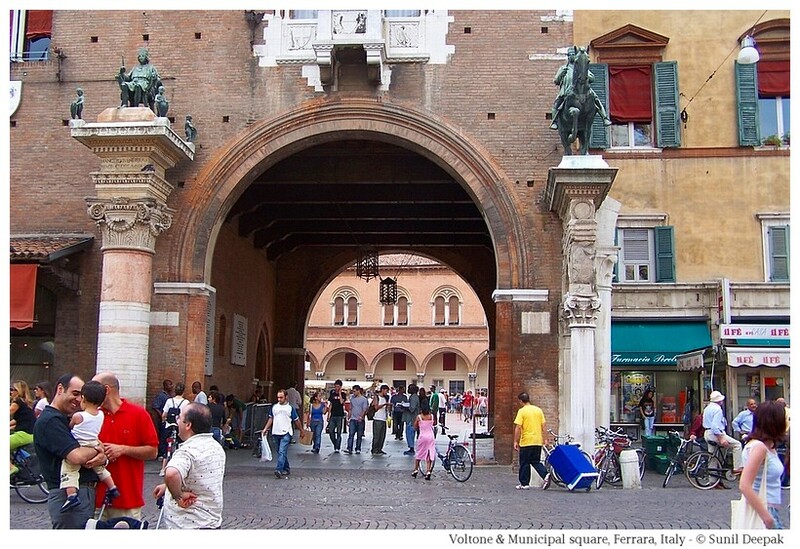 The history of the medieval and renaissance city of Ferrara is closely bound to the Este family. Their castle is the symbol of the city. For about two centuries the splendour and richness of Ferrara matched other famous cities like Florence and Venice or with other great European courts in France or Spain. Ferrara city grew up around a ford over the River Po. With its increasing prosperity, famous artists and intellectuals came to the city during the Italian Renaissance in the 15th and 16th centuries. Over time, the encircling walls of the medieval town were extended to accommodate urban growth, resulting in one of the first planned European cities where the medieval part of the town merged seamlessly with the new areas. Red and pink colours dominate in Ferrara city centre and is the city of bicycles. It is on the Bologna-Venice railway line and easy to reach. A 15 minutes walk from the railway station will bring you to the Este castle and the city centre. The city has numerous hotels and B&B for the tourists. 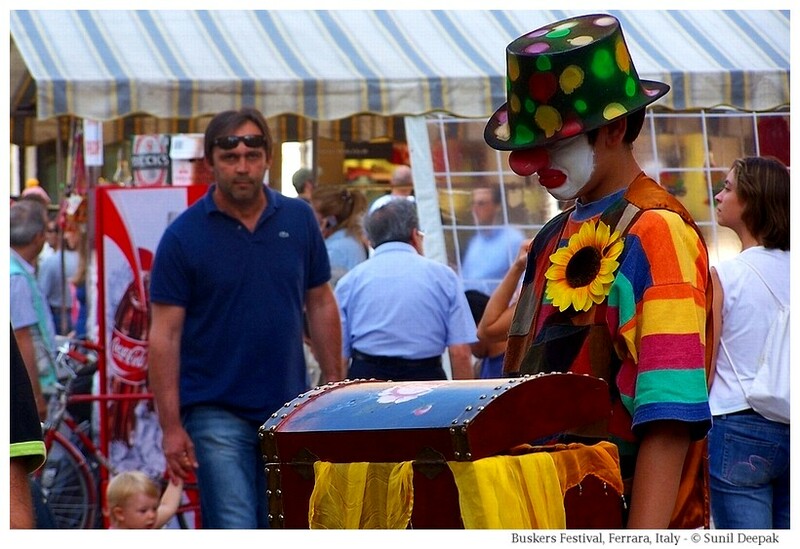 The Annual Buskers Festival brings street artists including musicians, acrobats, clowns, illusionists and dancers, from the different parts of the world. It is held over a ten days period in August of each year. In 2017, this festival will be held from 17 to 27 August. The festival has street artists exhibiting along the winding medieval streets of the city centre. 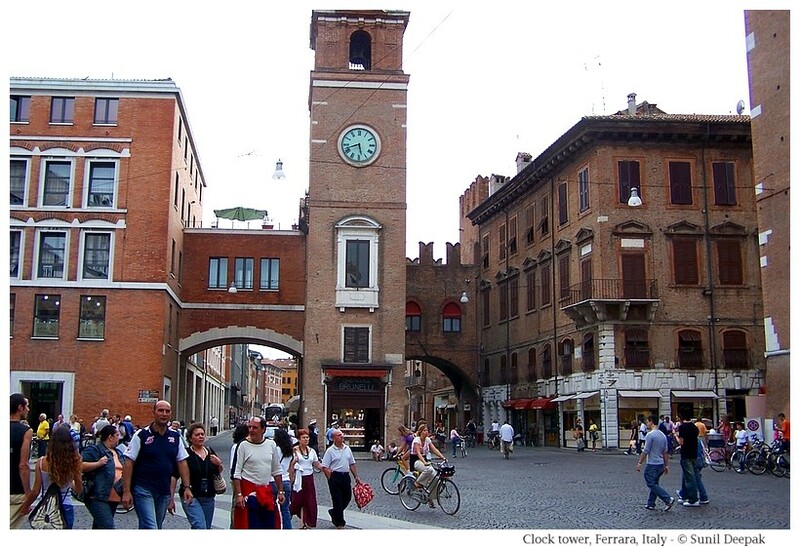 It is one of the best periods to visit Ferrara. This beautiful castle complete with towers, moat and draw-bridges was built in 1385 and then expanded over the successive centuries. The castle holds a museum and beautiful rooms with paintings, sculptures and frescoes. It includes hanging gardens built on a terrace. It is also a venue for different exhibitions and cultural events. For example, around Christmas the castle holds an exhibition of Christmas cribs from different parts of the world. The castle is surrounded by different squares which are also venues for different events during the year. 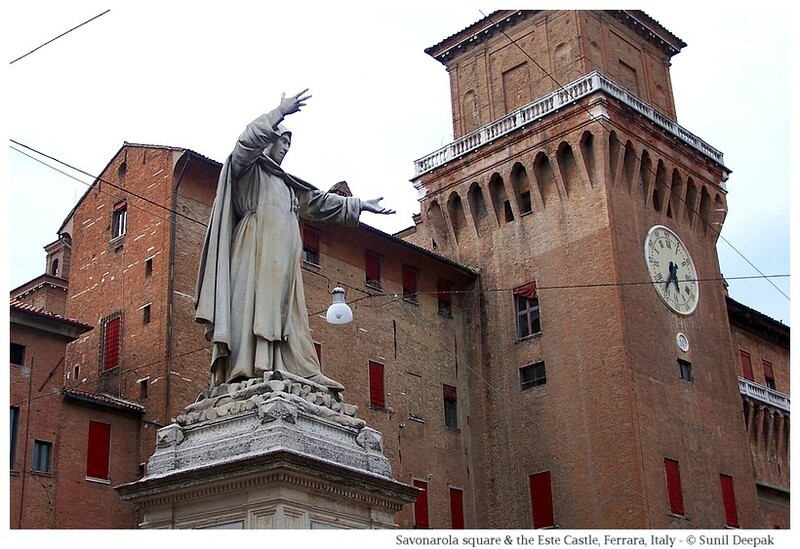 The image below presents the castle seen from the Savonarola square with a statue of Friar Girolamo Savonarola. It is a beautiful building in pink and white marble, a short walk from the castle. Its construction was started in 1135, initially in the Romanic style which can still be seen in the facade. The entrance shows scenes from hell and heaven. Over the entrance sits archangel Gabriel with a balance in his hands. In the image below you can see the cathedral facade with a group of musicians during the Buskers festival in the foreground. Inside, the cathedral is richly decorated in Baroque style and has different beautiful paintings and sculptures. Of special interest is a 16th century fresco by Bastiniano inspired by the famous painting of Michelangelo in the Sistine chapel in Vatican. The cathedral was damaged by the allied bombings during the second world war and has been reconstructed. 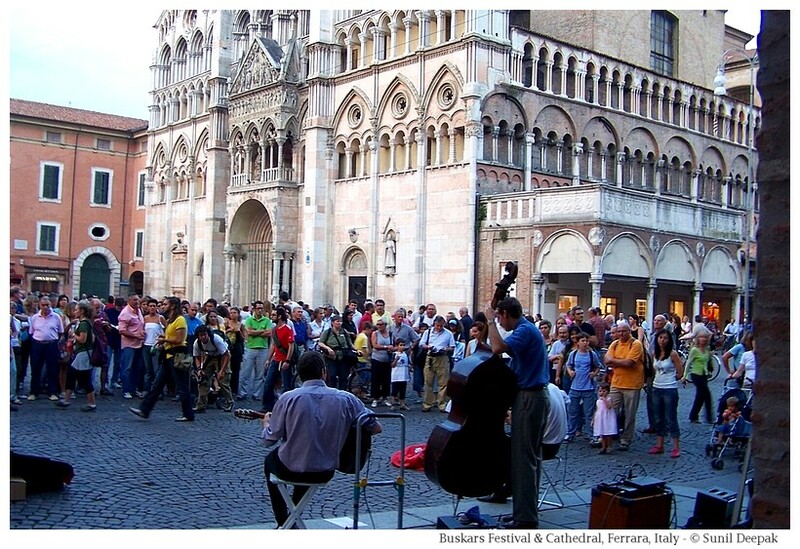 Next to the Cathedral is one of the largest and most beautiful squares of Ferrara called the Trento and Trieste square. From the square you can also see the 15th century pink and white banded bell tower of the cathedral. The image below shows the square during an open-air antiquarian market. On the other side of Trento and Trieste square once there used to another famous medieval building, Reason Palace, which was damaged during the second world war and replaced by a modern building. It's tower was built in the second half of 15th century and use to hold the Bell of the Reason. In 1864, a clock was placed on it. After the second world war, enlargement of the road brought this tower in the middle of the street and is known as the Clock Tower. On the opposite side of the road across from the cathedral, a high arched entrance called il Voltone leads to the Municipal Square. Before the construction of the Este Castle, the noble Este family used to live in the building of this square, marked by a beautiful marble staircase. The image below shows the Municipal Square during the Buskers Festival with the Staircase of Honour in the background. Above the Voltone arched entrance, there are two statues - a bronze statue of Borso d'Este (Este treasury) and a statue of Nicholas the III from the Este family sitting on a horse, shown in the image below. The urban expansion of Ferrara during the renaissance period led to the construction of new buildings outside the medieval town. 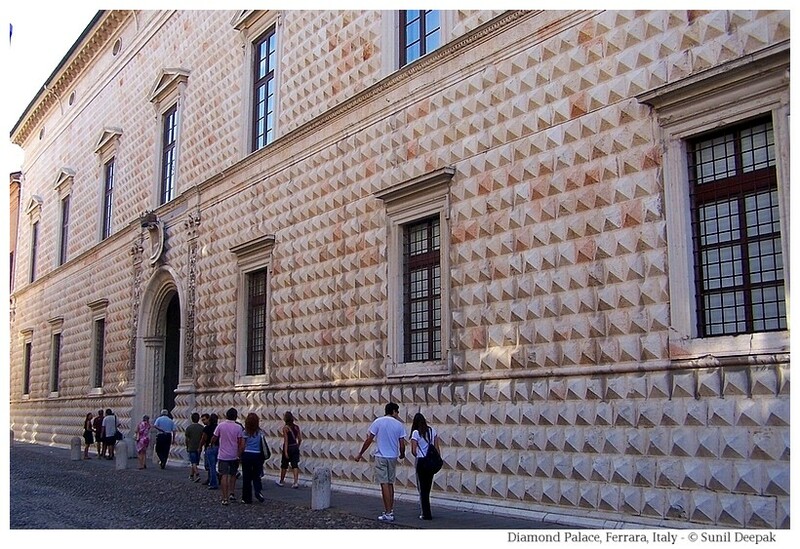 Among these is the Diamond Palace built in 1492, named so because of diamond shaped cones covering its external walls. The Diamond Palace holds the city art museum and is the venue of art exhibitions. 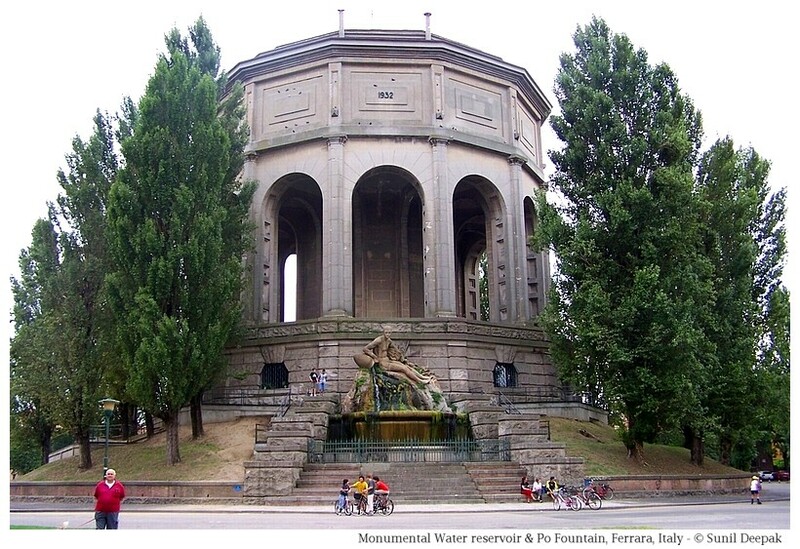 Closer to the railway station in the 24th May Square, there is another important site of Ferrara - the Monumental Water Reservoir with Acquedotto which collects and supplies water to the city. It is a tall round structure with columns, resembling a temple and holds a beautiful fountain showing the origins of river Po shown as a beautiful woman. 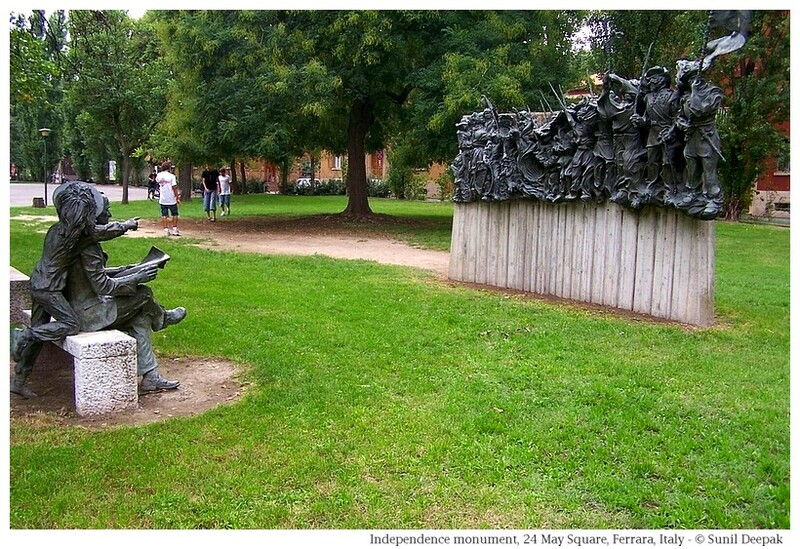 The park near the water reservoir also has a monument remembering the first war of independence of Italy against the Austrians, showing the historical "Bersaglieri of Po" unit of Italian military. The Bersaglieri wear a cap with a long plume. It is the work of the sculptor Fiorenzo Bacci. 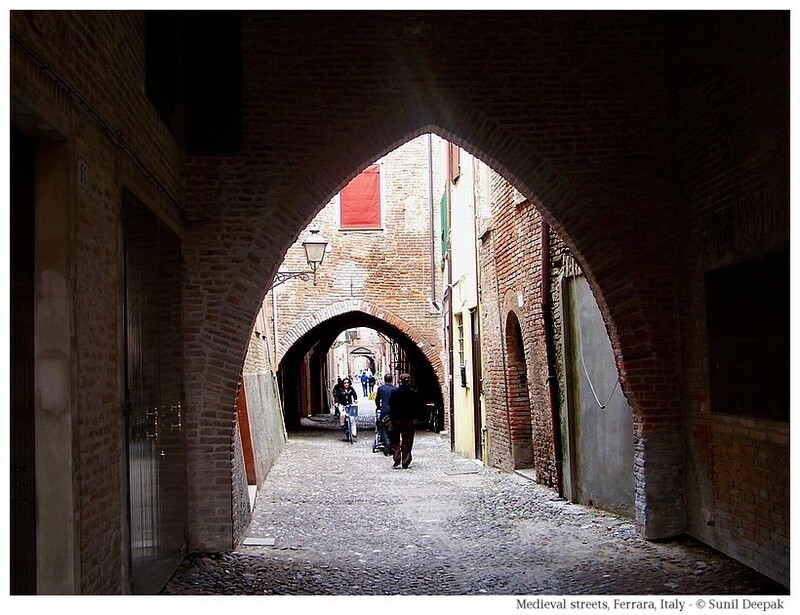 Apart from the monuments mentioned above, the narrow and twisting cobbled medieval streets of Ferrara around the cathedral and clock tower are worth looking at. Ferrara is a gem of a city in north Italy. Most tourists to Italy think only of Rome, Venice, Florence and Pisa. 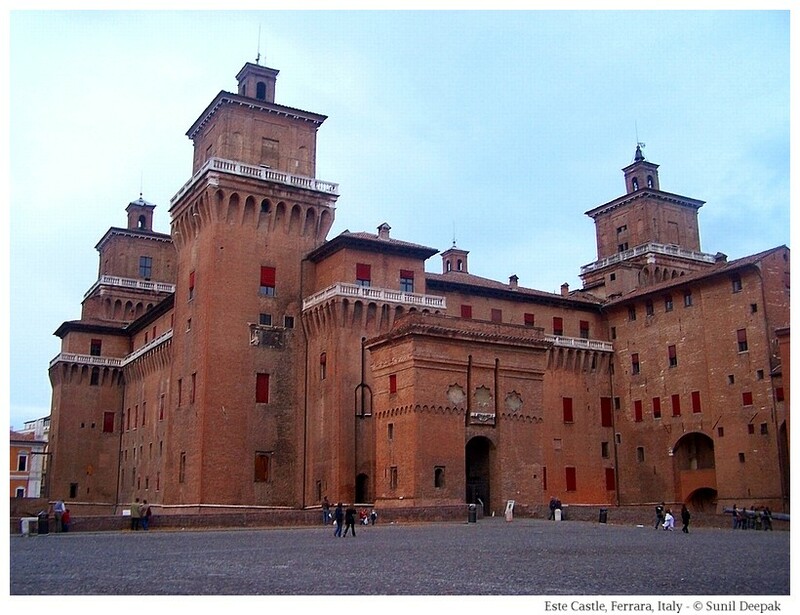 However, if you have a little time to visit it, Ferrara is definitely worth a visit. 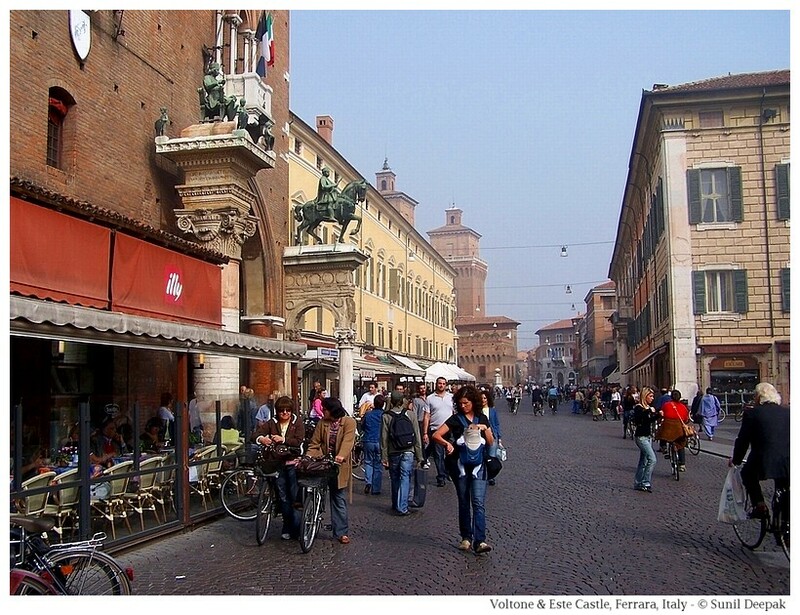 The last image of this post (above) shows the Corso Martiri della Liberta, the main street in the centre of Ferrara with Voltone on the left and the Este Castle behind it. This part of the city is closed to cars and vehicles.